It’s a well used cliche but the kitchen really is the heart of the home, no matter how big or how small. It’s where the first coffee of the day is drunk, food is cooked, food is eaten, homework is done, mess is made and all the best parties end up in the kitchen – fact. 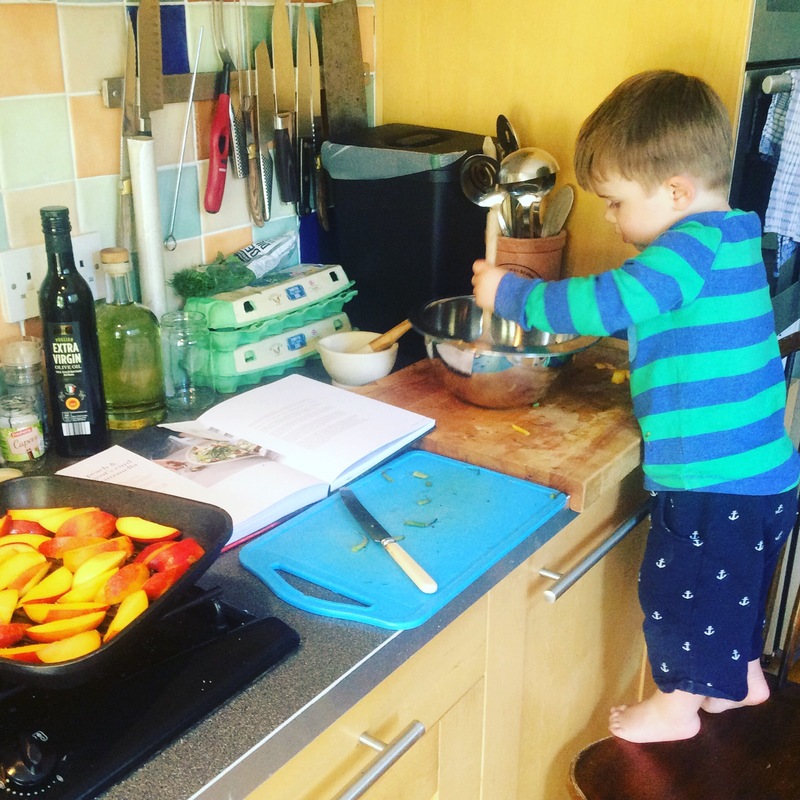 Encouraging children into the kitchen from an early age is something i’m a huge advocate of. My two have been in the kitchen by my side since they were hatched and one of Otto’s favourite things to do in the day is to help me prep and cook food, whether it’s measuring out ingredients, pretending to cut vegetables with a butter knife, stirring, whisking, blending or generally just making a mess. If you have OCD tendencies it’s best to take a sharp intake of breath, let the mess and chaos unravel, and be prepared to clean up afterwards. The fun and the memories are well worth it. 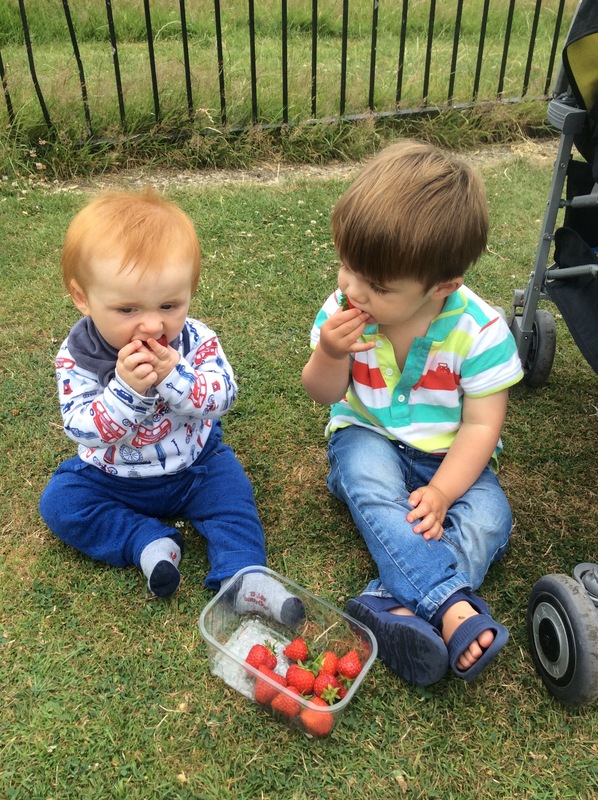 As food is such a big part of our lives and I love cooking I wanted to share this passion with Otto, and hopefully Reuben, early on, as it’s a vital life skill that should be nurtured as soon as possible. An appreciation of food, where ingredients are sourced and come from and how meals are made can be combined to become a fun daily activity as well as allowing you to put food on the table at meal times. Whether or not they’ll eat it, is another matter. Let’s just say Otto is going through a rather long fussy stage. It is of course important to ensure young children are supervised while in the kitchen. Ensure hot ovens and sharp knives are kept out of their reach as well as hot pots on the stove. However, the kitchen shouldn’t become a no go danger zone. I met one mum who kept her children locked out of the kitchen using a stair gate and she was slightly horrified by the fact Otto was in the mix stirring and blending. Unless their exposed to things, they’ll never know and learn about the risks associated. The key is to make sure it’s a fun environment and they have an opportunity to explore their curiosities. Give them their own drawer, home to their own equipment as well as their own apron, which will allow them to feel involved and part of the bigger picture. They will also love having their own stool, allowing them to reach up to the work surfaces. 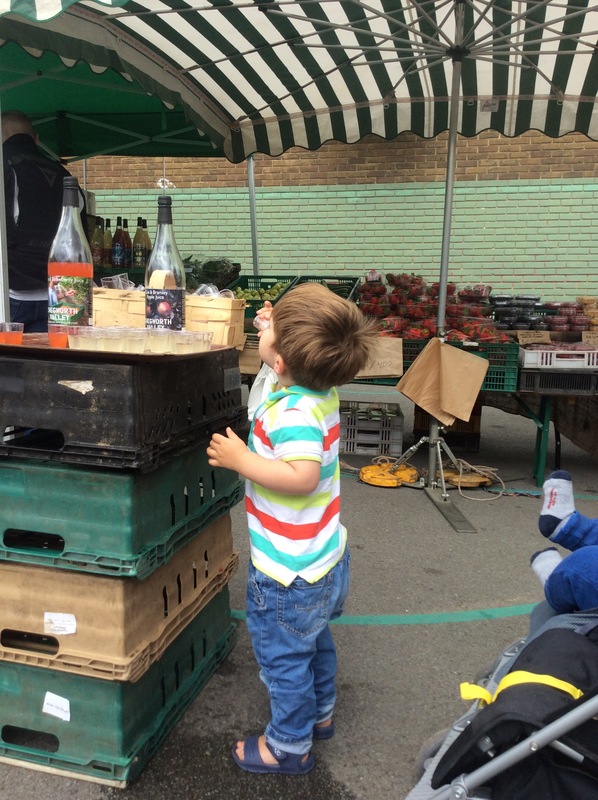 Involving children from an early age in the supermarket shop is also a great way to teach them about different ingredients. However pick a quiet shopping time and to avoid trolley meltdowns it’s a good idea to give them a piece of fruit or keep a stash of treats in your bag while you do the supermarket sweep. Trust me, this will prevent tantrums and panic buying. Supporting your local farmer’s market is also a great way to explore seasonal ingredients and get kids to taste interesting and different foods. Everyone loves free samples. It’s also a great way to meet the producers behind the food and learn a little more about where our food comes from. 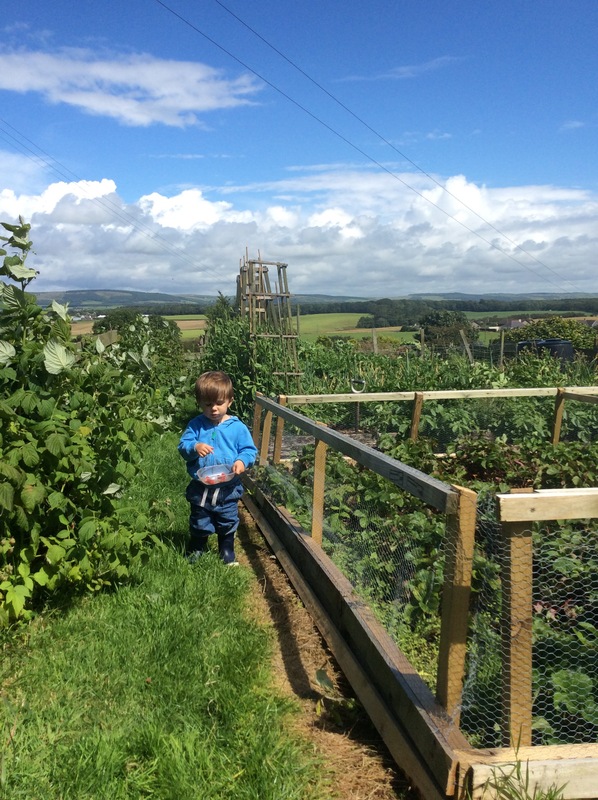 Similarly fruit and veg farms, which allow you to pick your own are not only a great fun day out but also educate children that fruit and veg doesn’t magically appear onto the supermarket shelves from no where. Gardening and cooking go hand in hand and another great way to get them involved in cooking is to plant a mini herb garden growing coriander, mint and basil or a chilli plant. You don’t even need a garden. All you need is a big enough plant pot for each of the herb plants and a window sill. You can water the plant daily and pick the herbs to add flavour to meals. It’s another great way to explore new tastes and smells. Encourage older children to get involved in meal planning by going through recipe books with you. Meal planning is a clever thing to do before you go food shopping as it prevents food waste and again allows children to feel involved and try new recipes. 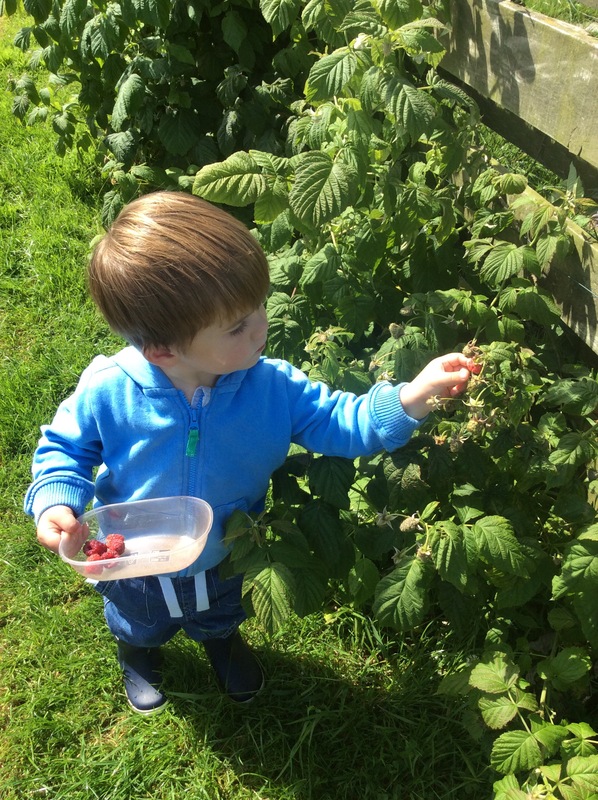 If like me you have fussy eaters, one of the most frustrating things about parenting, involving children in cooking and meal planning is a step towards exposing them to new foods and hopefully in the long run their taste buds will appreciate more than pesto and pasta. I live in hope. Even from as young as two, toddlers can learn new skills in the kitchen. You’ll be amazed by how much they can actually help. While you chop vegetables, they can place the chopped pieces into the roasting tin or they cash bash the digestive biscuits in a plastic bag using a rolling pin to make the base of a cheesecake. Measure out the ingredients you need in advance into small dishes and allow them to add each ingredient to a mixing bowl. This is an easy way to get them involved and they’ll love mixing everything together. If it’s a cake mix however the chances are they’ll be keen to taste test first before it’s spooned into the cake tin. Blending the ingredients together in a food mixer to make smoothies is another winner in our house, as is rolling out pastry dough, using a cookie cutter to cut out biscuit shapes, kneading dough for bread and making pancakes. Going forward each week I’ll be sharing recipes specifically designed to get children into the kitchen. 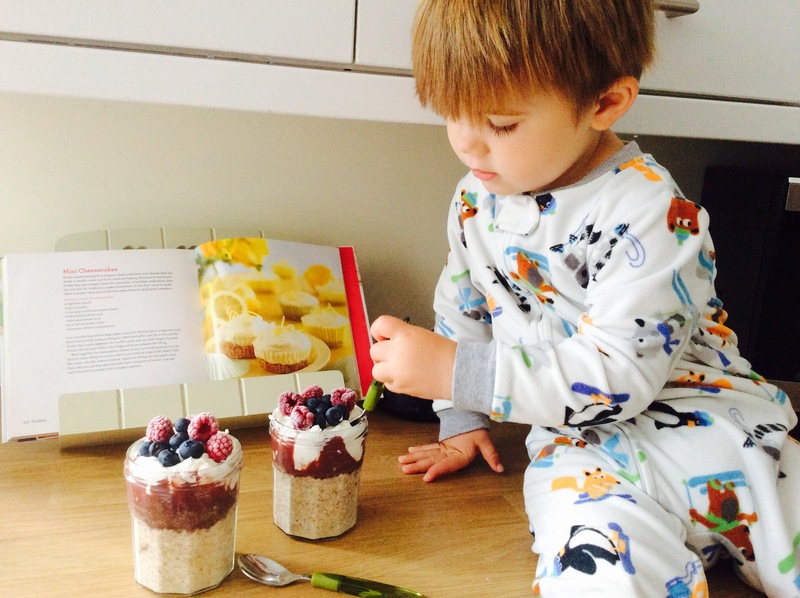 These breakfast pots using pouches from my favourite baby food brand Piccolo are quick and easy and taste heavenly in the morning. Feel free to half the portions for smaller tummies. Sometimes my eyes are bigger than my belly. 1. 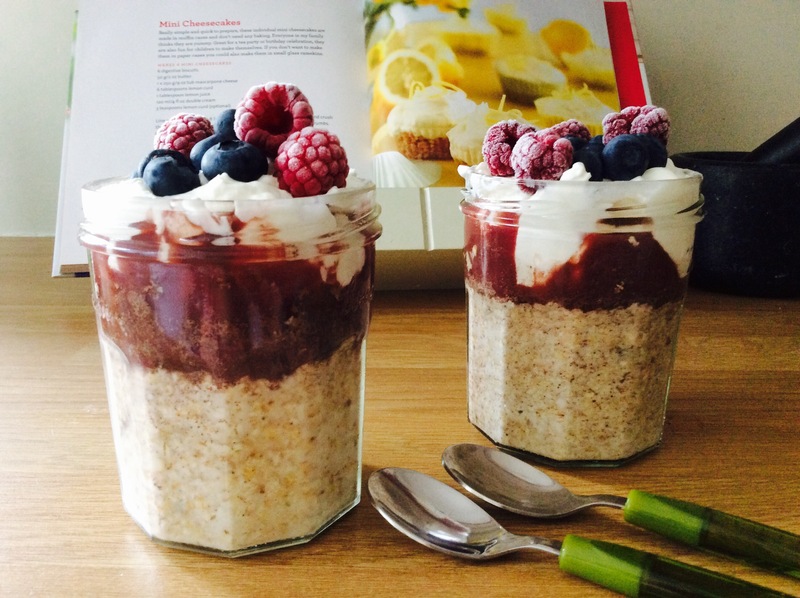 Add 1/2 a cup of porridge oats to a jam jar, cover to the top of the oats with full fat milk and stir in 1/2 a tsp. of cinnamon and a handful of sultanas to each jar. Allow to soak overnight in the fridge. 2. 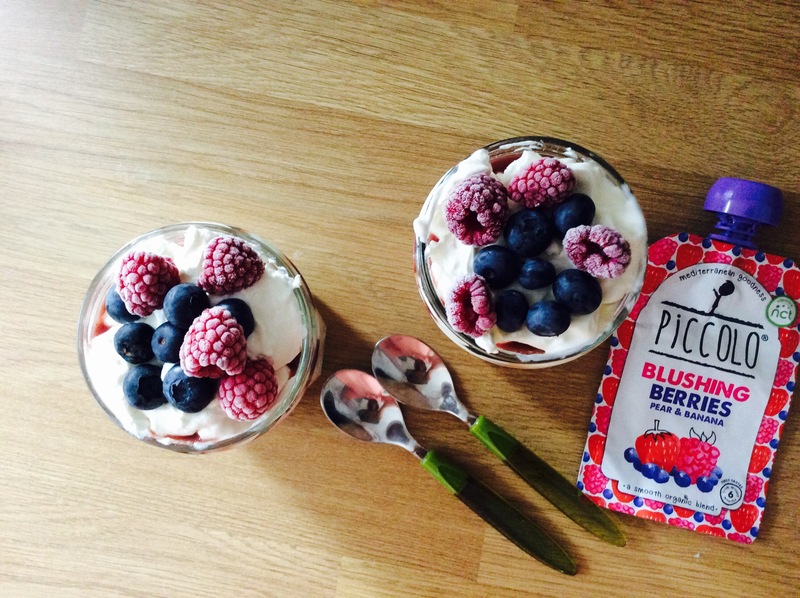 The following day divide a Blushing Berries Piccolo pouch between each jar on top of the oats. Top with full fat Greek yoghurt and fresh raspberries and blueberries. Ideal for breakfasts, snacks and puddings!